Bananas is the "appeeling" comedy show for the whole family! Don't miss it as comedian and ventriloquist David Pendleton shares center stage with some of his favorite puppets. From Mac, the self-aware "piece of wood," to sassy senior citizen Aunt Tilly, David proves that he can make anything talk. This episode is sure to be a hit with audiences of all ages. Bananas is more than just a guy (or dog, or baby) with a mic - its a variety show featuring interviews of the not-so-serious kind, as well as some hilarious unscripted moments caught on tape. Best of all, it's good clean fun for the entire family! 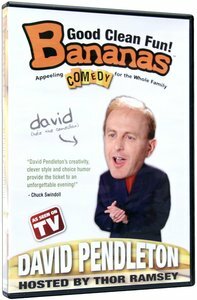 About "Bananas Featuring David Pendleton"